Expanding disks lead to what packing of the plane? 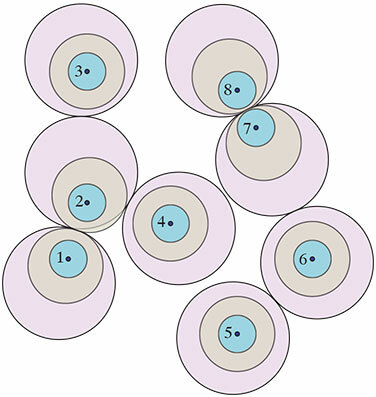 Here the disks do not yet touch at $t=1$ (blue), but at $t=2$ (tan), $\lbrace 1,2 \rbrace$ and $\lbrace 7,8 \rbrace$ are in contact, and by $t=3$ (pink), $\lbrace 1,2,3,4 \rbrace$ and $\lbrace 5,6,7,8 \rbrace$ are touching. Q. What happens? Is there some limit configuration as $r$ grows? Intuitively, it feels like all empty space would be squeezed out. Perhaps the behavior for points initially confined to a finite region $R$, as that region grows larger, would hint at the situation for the infinite plane? I'd appreciate pointers or observations—Thanks! Browse other questions tagged reference-request pr.probability discrete-geometry circle-packing or ask your own question. What is the oriented Fano plane? Which term is better for the so called “sphere packing”? Is the Ford disk packing optimal?